I enjoy curating content for the podcast; sure I have to take the bad stuff with the good stuff but the whole premise of sharing other’s content and adding a little of my own insight via the podcast is fun. I had some people ask over the past few months we’ve been doing this if I thought I was stealing content and basically republishing someone else’s stuff on our web site? Of course my answer was “I’m not”. 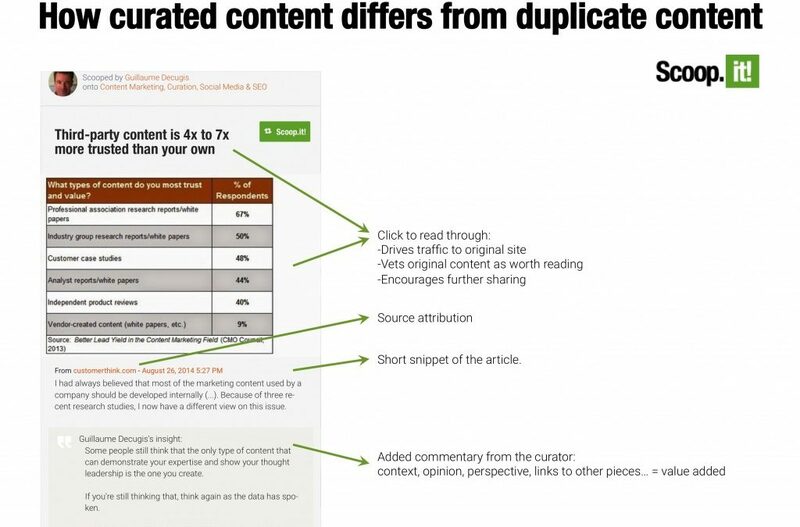 I know there’s been a lot written on the subject but recently I ran across an article that did a great job of pointing out what the difference was between curation and duplication of content. Guillaume explains the idea of content curation and the value it brings, what it is, what duplicate content is in the eyes of Google and a whole lot more on today’s episode of your ‘A Slice A Day’.